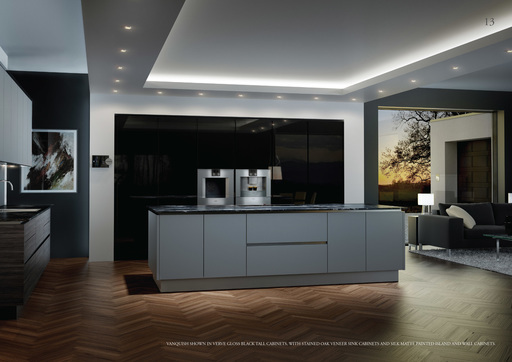 Our Award Winning Vanquish system design philosophy was to create a kitchen with presence, soul and performance, whilst maintaining the bold and minimalist lines of contemporary British architecture. Shown here with the technologically advanced pocket doors where the appliances can be simply hidden from view as shown above and to the left. Creating a real minimalist style. Sheer opulence surrounds the design styling. 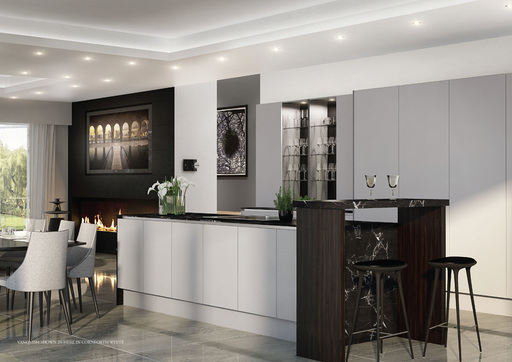 Shown here is the Vanquish with Verve Gloss Black tall cabinets, with stained Oak veneer sink cabinets and silk matte painted island and wall cabinets. Vanquish draws from exquisite British architecture of the modern age and effortlessly blends into spaces from our iconic and celebrated past. 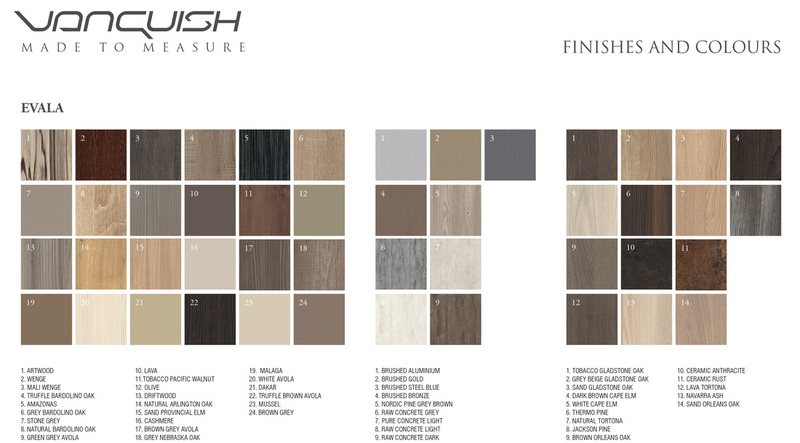 Vanquish's design application will integrate the refined and natural finishes into one piece of stunning architecture. With clever design the garden is 'pulled' into the home, creating a feeling of openness, light and space. 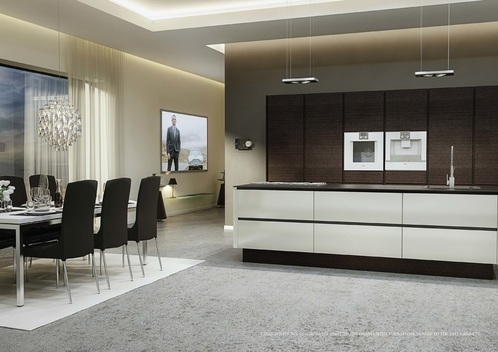 Vanquish shown on the left in silk matte paint to the island, with stained oak veneer to the tall cabinets. Any combination is possible, there are no limits to your imagination. 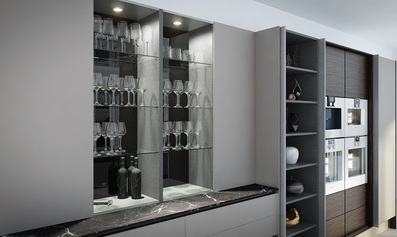 We can also create true bespoke hand built features such as shelves, library and other features into the design and can do the project from start to finish, including building work and other carpentry and cabinet makers work. Lighting design can integrate this seamlessly into the design. 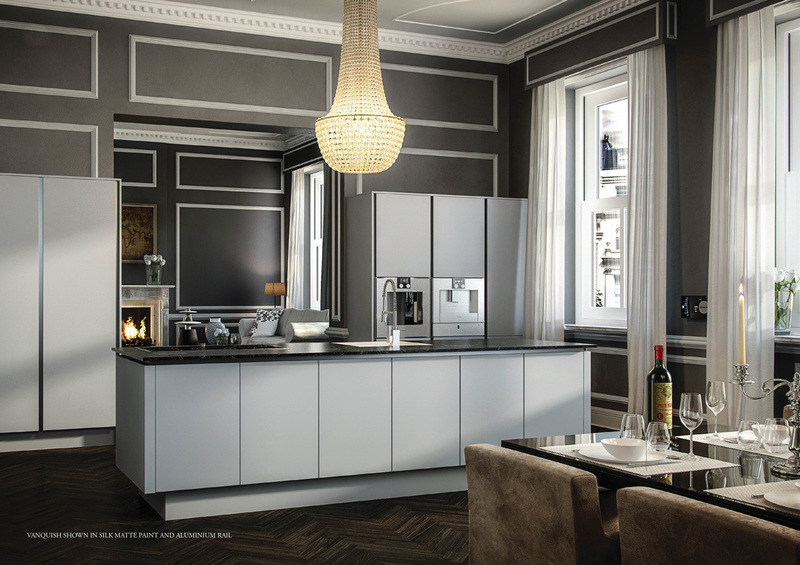 With the Kitchen Visions Vanquish range it is possible to achieve that real look of opulent grandeur that is often copied but seldom achieved. The opposite look here being achieved by Vanquish in matte paint and aluminium rail.